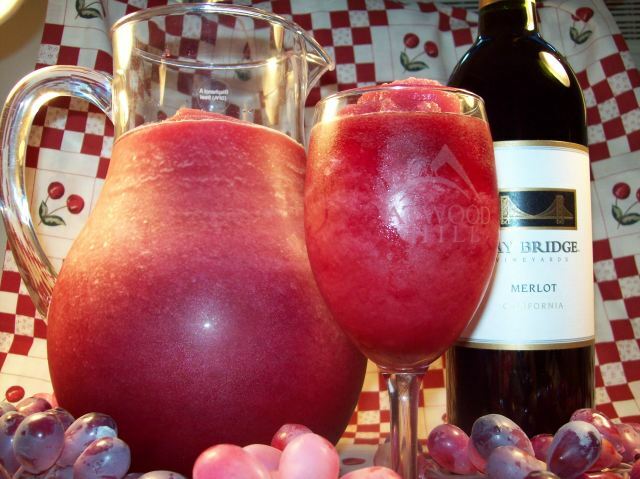 Frozen Wine Slush Mix - Monster Money Maker! 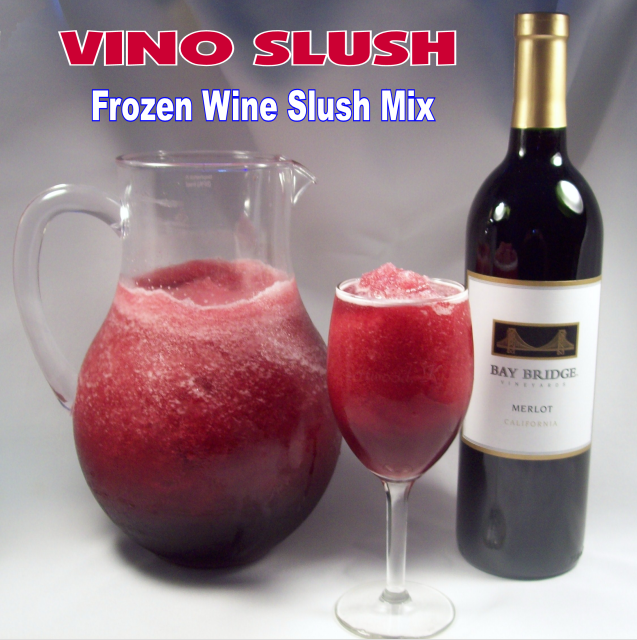 Vino Slush is a wonderful new wine slush drink mix that you mix with any kind of wine and water. Just mix it, freeze it and stir it up into a delicious frozen treat. Or you can use a blender to save time. This wine slush craze is sweeping the country. It’s the new way to drink wine. So refreshing, so chic and sophisticated, yet so much fun and tastes so darn good. Your customers will be raving about this product. And repeat business – wow! It’s tremendous. You will find that even many people who don’t like wine (myself included) will love it when it’s made into a wine slushie with Vino Slush. 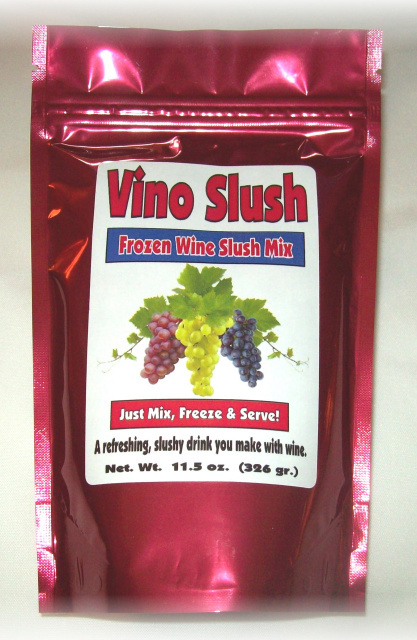 You can start your own business selling Vino Slush wine slush mix for as little as $118.50 for one case, plus shipping. It's easy to also add our bread dipping mixes in addition to our Vino Slush. You can sell it at a variety of special events and rarely ever have much competition. The product sells itself. No need to have a liquor license either. We'll tell you how. 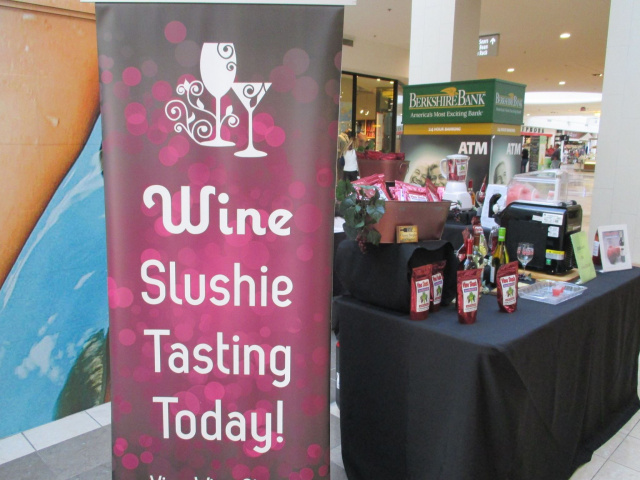 You are able to sell Vino Slush at so many different kinds of events. Always try to get into events that have an affluent customer base. The more money your customers make, the more educated they are. The more educated they are, the more cultivated their tastes are. The more cultivated their tastes are, the more wine drinkers you will have. The combination of more wine drinkers, and customers who make above average incomes combine for your perfect target customer for Vino Slush. There are wine festivals everywhere. That’s an obvious event to get into. However, many other events work beautifully also. Large festivals of almost any kind are also good events simply because they draw so many customers. Large crowds solve all of your demographics problems. The sheer numbers of people alone will ensure your success. You must offer samples to achieve these results though. More about easy sampling later. At most smaller events you will have zero competition. If you do have a competitor, it will most likely be at a major sized event. However, with our lower wholesale prices, you will be able to sell our Regular Bags at $8.00 to $10.00 per bag. At $8.00 per bag (I sell them for $9.00 or 3 for $25.00 unless I have a competitor.) you will most certainly be selling at a lower price than any competitor. They would probably be selling gift bags only - at $10.00 to $12.00. Just add one bottle of any kind of wine, and one bottle of water to the Vino Slush mix. 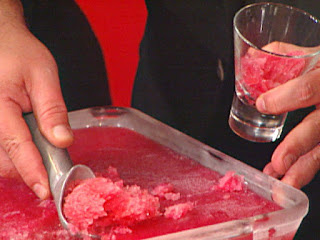 Mix it up until the mix is thoroughly dissolved and stick it in the freezer for 4 hours or more. Let it thaw, if needed, enough so that you can get a spoon down into the bottom of the container to thoroughly stir it up. The wine flavoring sinks to the bottom as it freezes, so it is very important to get your spoon all the way to the bottom of your container to throughly mix up the entire batch of slush to get all of the flavoring mixed together. If you just scrape slush off of the top of the batch without thoroughly mixing, it won’t taste right because all of the flavor is at the bottom. You can also make Vino Slush in a blender for faster results and perfect consistency. Just put half of the bag into a blender, add wine and ice. Blend until smooth. That’s all there is to it. In the state of Ohio, we are not allowed to give away free samples of any alcohol without a liquor license. Therefore, I provide sampling with non alcoholic wine. I purchase it from my local grocery store for $6.99 per bottle. There are two major wineries that produce non-alcoholic wines – Fre and Ariel. 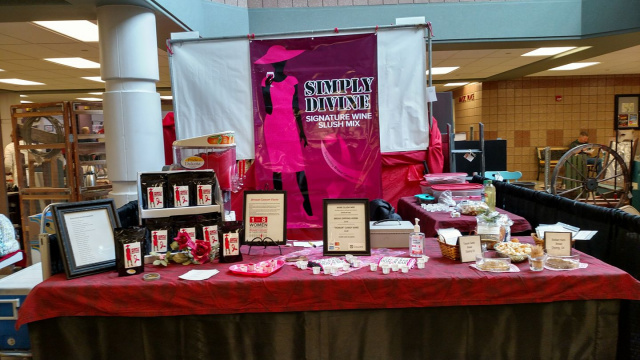 I use Fre Merlot or Fre Premium Red for sampling. I have contacted Fre and found that if you don’t have a local place to buy this wine, the company will ship to you at wholesale prices if you buy by the case. I believe the minimum order is one case. I don’t remember the price, but even with shipping, considering you get hundreds of samples from one bottle, the price was easily affordable. The sale of only two bags more than pays for a bottle of the wine plus shipping. So, being able to sample with non-alcoholic wine should not be a problem. You can have it shipped right to your door. As an alternative to non-alcoholic wine (which I strongly suggest) you may also make samples using 7-Up. I know that is being done, but the more you can make it taste like real wine the better. I can guarantee you that if you use Fre Red or Fre Merlot, you will get results. If you live in a state where you are allowed to give away samples using real wine, so much the better. Use the cheapest brand of wine you can find. When testing my recipe, I used wine that cost $3.99 per bottle. Don’t waste you money on expensive wine. It isn’t needed at all. ICE CHEST: Sampling can easily be done using an ice chest as long as your health department allows it. I make up batches of the mix in Tupperware type containers made by Gladware. It’s sold at most supermarkets near the zip lock bags area. Get one the size and shape of a shoe box. It holds one full batch perfectly. Then pour that batch into three separate smaller sized Gladware containers that is about one third the size of your shoe box size. Freeze them. Put them in an ice chest with some freezer packs and they will stay frozen all day. When you order your first order of Vino Slush, I will send more detailed instructions on exactly how to offer samples using the ice chest method. FROZEN DRINK MACHINE: You can also use a frozen drink machine which will make your sampling much easier, but it does require electricity. (You may be able to use a generator or marine battery for electricity if your venue allows it.) The frozen drink machine is expensive and heavy, but it makes the sampling so much easier and it offers perfect consistency of the product. Make sure you check with the health department to see if you need to have a triple sink system and hand washing sink to be able to use this method. They will usually let you use three plastic bins for this and an Igloo drink dispenser with a faucet for the handwashing. MARGARITA MACHINE: There are also frozen drink makers on the market that shave ice cubes and blend the shaved ice with the wine and water mixture into a slushie drink. You can find them on the Internet for $200 to $600. The more expensive one has a battery that allows you to use it without needing electricity. It only weighs 21 lbs. and a fairly heavy duty machine. Make sure your health department allows it before you buy one. Or you can purchase professional grade machines that you see in convenience stores for over $1000.00. Search the Internet for them. I would like to place another order for two wholesale boxes of slushy mix as we have in the past. We have started selling the mix with our own labels so that has really increased our usage. When you get a chance, would you send another 2 cases of the Vino Slush mix our way? Although the weather has cooled, we find it markets well as a stocking stuffer. It's a beautiful Fall day here in Eureka Springs. Would you please send another two cases of Vino Slush our direction? Going through it like crazy and need some more. Can you please send me 3 cases of mix? You can bill the card on file. These are a huge seller. People love them! Vino Slush sales have sky rocketed. I would say over 70 % of our profits comes from the sale of the Wine Mix. As people walk by the tent not planning to stop.......as soon as you mention the Vino Slush they do stop and come back for a sample. Once they taste it they have a desire to buy. In a couple of weeks I will be ordering multi boxes of the Vino Slush Mix. 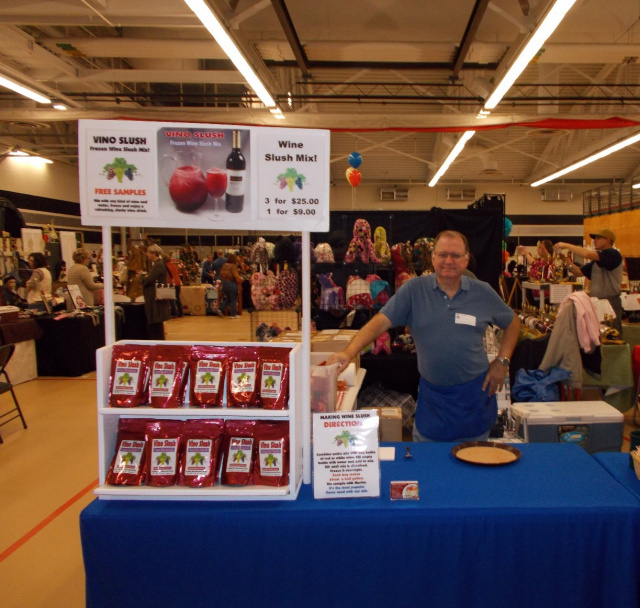 can sell sampling with Wine or Apple Cider. Simmering pouch included - no skimming needed. fragrance of aromatic spices and citrus. DIRECTIONS: Remove simmering pouch from package. Fill pouch with spices. Pull drawstring closed to contain spices. WINE: Add two bottles or more of any red or white wine to any pan or crock pot. (Optional: Add one half cup of sugar.) 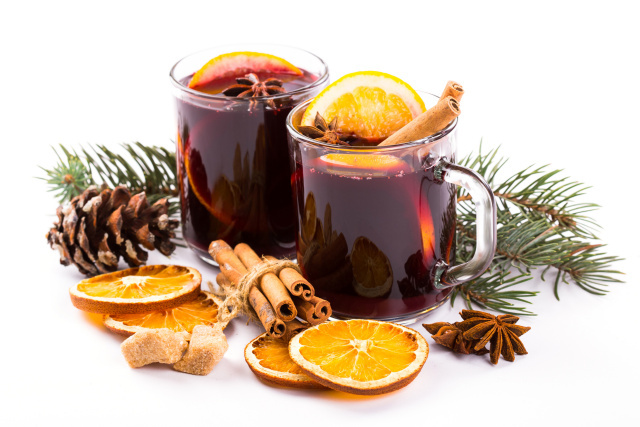 CIDER, TEA OR JUICE: Add one half gallon or full gallon to pan or crock pot. Add pouch of spices to pan or crock pot. Simmer slowly for one to two hours. DO NOT BOIL. Remove pouch from pan or crock pot and enjoy! SAMPLING: So easy to offer samples. Just set out a crock pot with a small ladle and small cups and let your customers help themselves throughout the day. 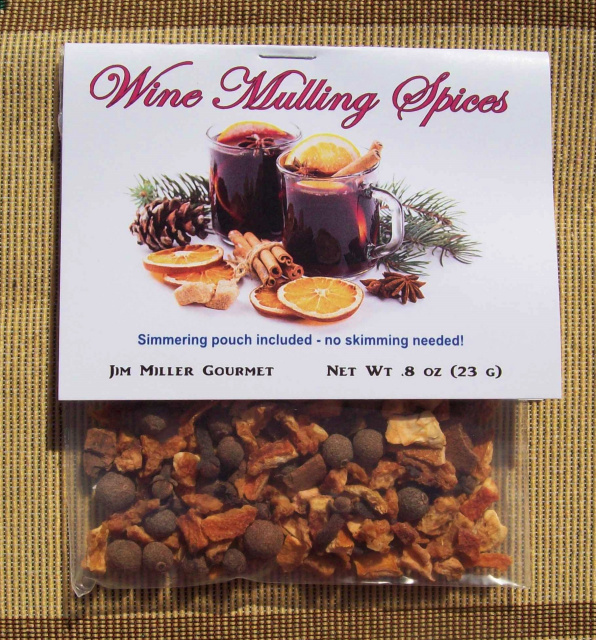 Put up a sign saying, "FREE SAMPLES OF OUR MULLING SPICED DRINK". Your customers will love this product. SAMPLING SELLS! 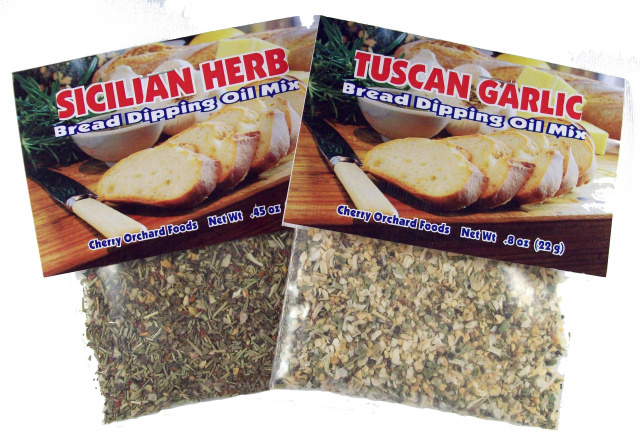 At only $1.50 per piece, you can easily sell these wonderful bread dipping mixes at $4.00 or 3 for $10.00. Just add these mixes to a cup of olive oil and shake them up. Pour it onto a plate, add some pieces of bread (with tongs or toothpicks) and let the customer sample it themselves. Easy, easy up-sell. For your first order, call me at 513-752-2646. Give us your credit card info, shipping address, etc. After that first order, just call us or send us an email of your order and we’ll just bill it to your card. Or you can pay by PayPal. Thanks again. I look forward to working with you. Questions? Email me, Jim Miller, at mrfun20@aol.com or call 513-752-2646.